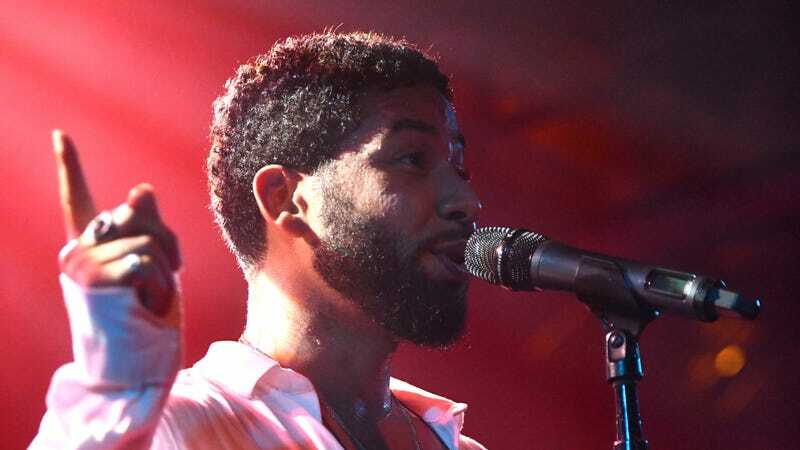 Singer Jussie Smollett performs onstage on February 02, 2019 in West Hollywood, California. Jussie Smollett may be bruised, but he isn’t broken. The 35-year-old made his first public appearance on Saturday night since his reported attack. “I had to be here tonight. I couldn’t let those motherfuckers win,” he shouted to the exuberant crowd in triumph, per The Hollywood Reporter. Chicago police are currently investigating an attack on Smollett, who was reportedly targeted by two men in ski masks who hurled racist and homophobic slurs at him and tied a noose around his neck. The FBI is assisting the city department in the matter, due to a previous threat Smollett received in the mail. According to CNN, the actor-singer performed at the Troubadour Club in West Hollywood to an audience of over 300 people and clarified some things surrounding the reported homophobic and racist attack against him. Assuring that now’s the time to be “blacker and gayer,” the 35-year-old pointed out that he’ll continue to lead with love despite the “hateful rhetoric” spewing around. Along with love, Smollett championed his resistance.